What a day! 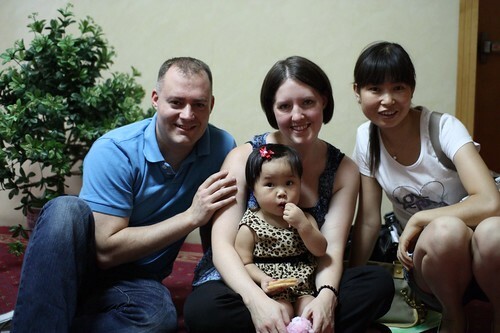 Our gotcha day with Mackenzie was scheduled for four in the afternoon, and by the time our guide arrived at our hotel at 3:30, we were nervous, I felt a little nauseated, and felt like pit sweat was running profusely. Our guide took pity on us, and took us to the Civil Affairs office early, so we could wait there, in hopes that maybe Mackenzie's group would also be early. Of course, we thought that was a grand idea, so off we went! There were several other families already there when we arrived, and meeting their little ones, many of whom were very unhappy. Watching them made us more nervous, so we went out into the hall, and just as we were walking out, Mackenzie was arriving with her nanny! She was very quiet and reserved, but there were no tears then, as they handed her off to me. The nanny stayed close and answered questions we had given our guide, and then apologized profusely for a bruise on Mackenzie's lip, where she had fallen down the day before, and then for a bruise on her arm where another baby had bitten her just after that! Poor thing had had a rough day! But she looked great to us! Ha! We gave her some of the snacks we had brought, and a lollipop, and she watched us all talking and asking questions. She watched the other children who were crying, but she did not cry. Then the nanny took a picture with us, and started to get ready to go. That's when Mackenzie started to cry and I was relieved. We headed to the photographer, and got our family picture taken for the adoption registration, then headed back to our hotel room. We did a little paperwork with our guide, and then settled in to play with our girl. The stacking cups were a big hit, as was the blow up ball, and she let us play with her for about an hour, before she wanted her shoes back on. So we decided to try the water. We ran a bath, and threw the ball and cups in, and she was happy to get in and play with them, even though it took a little while for her to actually be ok with sitting in the water. She thought it was great fun when I started pouring water on her, and babbled away to herself in sweet little baby words while she played. She probably would have stayed in the tub forever, but when she was getting all pruny we got her out. Josh gave her a bottle, and she fell asleep on his chest. She never really cried again, but does this heartbreaking thing where her lip comes out, and she has a few tears, but she lets us hold her, and rub her back, and let's us cuddle her a bit. We were glad to see a few smiles yesterday, and hope for more today! We do expect to see some grieving, as well though, and we are so grateful to those of you we know are covering us in prayer. Please keep praying for her health! Her breathing gets a bit laborered when she is playing or is hot, and it will be close to 100 today! oh, i looooooove these pictures of your family! congratulations and safe travels back home!! Oh, wonderful! What a precious beginning. I am so blessed to hear how smoothly it went for you and will continue to pray for a smooth transition. Oh she is just precious!! I loved reading this and the photos are wonderful! Your daughter is just stunningly beautiful and she sounds like she is such a brave little girl, letting you in even though her world just disappeared on her. Congratulations you are a beautiful family and your happiness just radiates! Hi, this is Shana fromt the TW yahoo group! So happy to see all together! Congratulations! She is precious! So so beautiful!! Praying for you guys, and can't wait to meet her!!!! I'm so glad that Mackenzie is adjusting well. 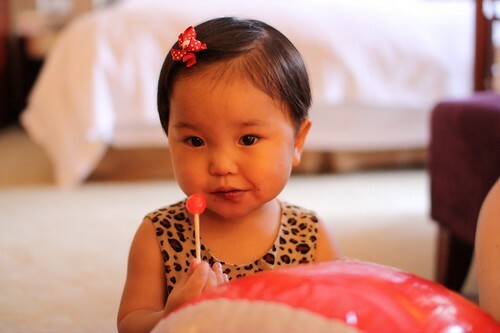 She is adorable and I hope that your days in China go smoothly! What a wonderful day! Thanks for posting photos. Congrats and enjoy this special time. she is beautiful. praying for her health. What a beautiful day. She is just breath taking Joanna. I'm so happy for you and Josh and of course your little "M"!